The Mr Foley's Cask Ale House, Leeds, LS1 5RG. 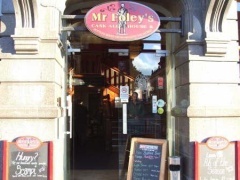 The Mr Foley's Cask Ale House pub review, map and rating. Looking for a Hotel near The Mr Foley's Cask Ale House? Very much a town centre pub (and, on the Saturday night of our visit, extremely busy).... but with a very wide selection of good beer. The 'last pint in the barrel' my mate got was quickly changed and the busy staff were very efficient. If you ever imagined you had had a really good night out (even a week... or a month):- take a trip downstairs to the toilets and, on the way, count all the real ale beer labels displayed that you have never tried!!! It's quite humbling!!! Defininitely worth including in any night out in Leeds.